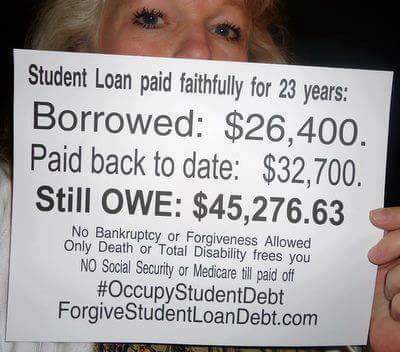 Student debt is a life-destroying trap, engineered by Wall Street and backed by the US government. As ever-pricier degrees have become the price of entry to the job market, students and their families have had no choice but to load up on punishing debt, and, not surprisingly, they struggle to pay it back. Universities have tried dirty tricks and even out-and-out crooked arm-breakers to collect. Now there's a new tactic, one that dumps the collection of these dirty debts back on the taxpayer: Universities sell their debts to bill-collectors, the bill-collectors lard on spectacular "fees" and "penalties," then they get court orders for repayment, and those orders spawn contempt-of-court charges, and then the arrests start. It's a new debtor's prison, something that's been outlawed in the USA since 1833. The beneficiaries are investment banks and their investors, university administrators who command an ever-higher proportion of the ever-higher tuition bill, and the collection agencies. The losers are the tax-payers, the poor families who are desperate to buy their children a chance for a future at any cost, and the adjunct faculty and instructors who do the real work of universities. Oh, and the future. The future totally loses out here. That's what happened to Paul Aker. Seven armed U.S. marshals arrived at his door in Houston last Thursday, arrested him on the spot, and took him to jail. He owed all of $1,500, outstanding since 1987. Aker told Fox 26 that without any warning, his 29-year-old debt was forcibly being collected; the marshals took him to federal court and made him sign a payment plan. “It was totally mind-boggling,” Aker told Fox 26. Texas congressman Gene Green explained to Fox 26 that the federal government has been contracting out student-loan collections to private debt collectors, who are allowed to deploy the U.S. marshals as their enforcement arm. “There’s bound to be a better way to collect on a student loan debt,” said the congressman. Around Houston, that "better way" involves 1,200 to 1,500 arrest warrants. Student debt is at an all time high in the U.S., where students hold an average of $35,000 in federal debt, according to an analysis of government data on Edvisors.